Captiva St. Augustine, a relatively new release from the University of Florida, is one option for shady areas. 1) Measure how much sunlight those areas receive. This doesn’t have to be exact; just walk outside (or look out the window) and jot a few notes on whether the area is receiving full sun, partial sun, or full shade at several different times during the day. 2) Check the canopy over the area. It is high and somewhat open (for example, high oak tree limbs that allow dappled sun through) or dense and relatively low (producing deep shade for long periods)? 3) Consider how the current groundcover is performing. Is it still relatively thick, thinning a bit, or down to the dirt? If you have at least five to six hours of sunlight daily you might consider a St. Augustine grass like ‘Seville’ or ‘Captiva’ (there is another variety, ‘Delmar’, which has performed well in less sun, but it is an older variety not widely produced in Florida). Centipedegrass can tolerate a moderate amount of shade, as can Empire zoysiagrass, but paspalum, most bermudagrasses and bahia, as well as Floratam St. Augustine, are sun-lovers that need six to eight hours of full sun daily. 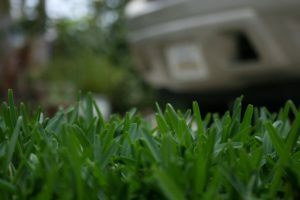 If you have deeply-shaded areas where turgrass hasn’t done well, you might consider trimming the overhead canopy if it’s appropriate and part of your landscape plan. Otherwise, consider an alternative ground cover that would work with how you use the area or install a planting bed. Want to learn more about how to select and care for turfgrasses in areas with shade? Check out this University of Florida/IFAS publication by Dr. Laurie Trenholm: Growing Turfgrasses in the Shade.